Lots of geeks like to spend some time on a three-day weekend doing fun, spare-time coding. If you’ve been curious about ThinkUp and have a little extra time this Labor Day weekend, come on down! ThinkUp’s come a long way so it’s easier than ever to dive in, try it out, and experiment. Test ThinkUp’s new easy installer. 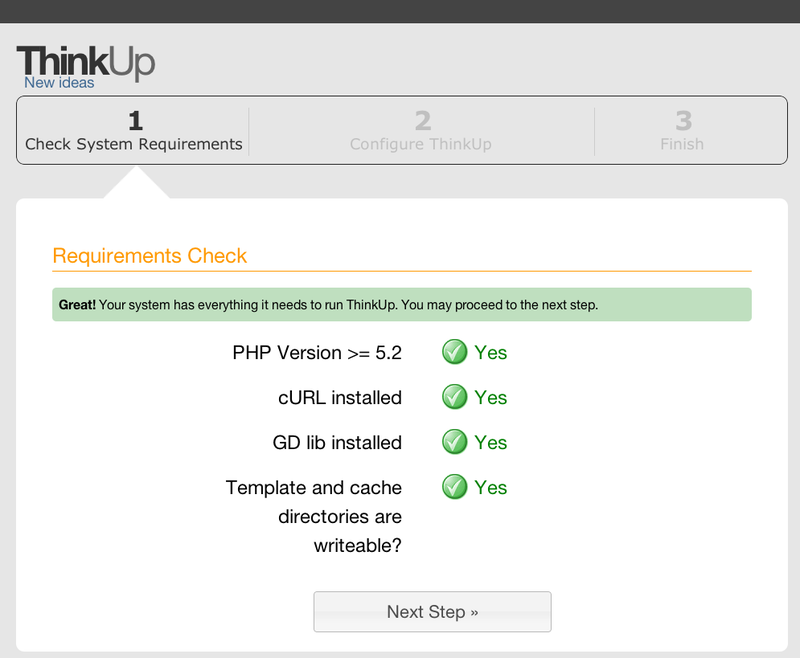 Running git, wrangling MySQL scripts, and creating symlinks is no longer required to install ThinkUp. If you’ve got a web server with PHP and MySQL, we’ve got a dead-simple web-based installer file that should have you up and running in just a few minutes. Download the latest .zip distribution of ThinkUp, extract it to a web-accessible folder on your web server, load its URL, and go. We need as many people to try out the installer on as many different web hosts and setups as possible, so let us know on the mailing list how your installation went. Document ThinkUp’s new installer. The ThinkUp wiki still has the old, long, scary list of steps required to install the app in it. Dive into the wiki and update the Windows, Mac OS X, and Linux/Dreamhost installation instructions. If you’ve got screenshots, add those too! Create new data visualizations. Now that you’re running ThinkUp and have a database of all your posts, replies, links, and friends, how do you want to visualize that data? Suggest or build a cool new way to visualize social data inside ThinkUp, like our new Google Map of post replies. Dive into plugin development. Those of you with more time and experience can help us extend ThinkUp. We made this application an extensible platform, so almost all of its functionality is in the form of plugins, and we need help there. The Twitter plugin could be ported to use the new Site Streams beta. Our Facebook plugin uses the old Facebook Connect instead of the new OpenGraph. We need a Bit.ly and a Google Buzz plugin. If you’ve got experience with APIs, we need you. Check out ThinkUp’s example “Hello ThinkUp” example plugin to get started. Have a great Labor Day weekend, and we hope to hear from you on the ThinkUp mailing list. I am a newer programmer but would like to start assisting in some of the Thinkup coding. But, since I am new and don’t know ALL there is to know about coding it would be nice if you could lead me in the direction to start.